I have sensitive eyes so I find candlelight much less painful than electric lights. Candelight is often more soothing too. 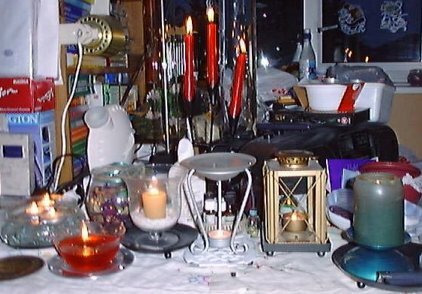 This means that I have an assortment of candles which are shown here. They range from floating candles to gel candles and lanterns. There is an oil burner in the centre of the arrangement. When all the candles are lit at once as here it lights up my room brighter than daylight. Click on each candle for a description.